We'd heard stories about Midway House. Tales of epic shows happening deep down in the basement of this punk rock squat house in St. Paul. STNNNG kicked off their epic 10th anniversary show run—during which they played Midway, then the Turf, then Big V's all in one goddamn night—at the house and Friday night you could still hear Ben Ivascu's merciless drumming reverberating off the concrete walls. On possibly the coldest night on record (-6 actual / -24 "feels like", whatever that means), it was BEAR & Portage's turn. To the very brave souls who put on long johns and parkas and flannels and trudged through a foot of snow over to St. Paul, we thank you. One of the guys living in the house, Steven Charles, opened up the night with some dark cowboy songs he's been writing lately. I'd never met him before, but he helped us load our gear in and told me I've got "very beautiful and long fingers" so instantly he had BEAR's paw of approval. His songs were loose, Silver Jews-y in their delivery, and cleverly written. Kudos to him for opening the night. Then BEAR played. Opened with our #1 smash hit "Camping" followed by "Ghost Town" (working title) and then "Texas Romance" and then "Wolf" and then "Trapp" and then "Seasick" and then we skipped "Beach" (working title) because my voice was beginning to give out and closed the night with "First Time I Saw The Devil." A fun set indeed. Loose, raucous, rough-hewn—exactly how a house show set should be. Then Portage left some jaws on the floor. Trent, Adam, Dave, and Jason were the kindest of dudes and the most exceptional of musicians. Me and Dave go way back to our Duluth days, so it's always fun to see him around town in a rock-and-roll context. In this case, he was playing organ with reckless abandon while Trent crooned over dissonant guitar chords and Adam beat the hell out of the drums—keeping it heavy on the floor toms (which I'm way into if you ask anyone). 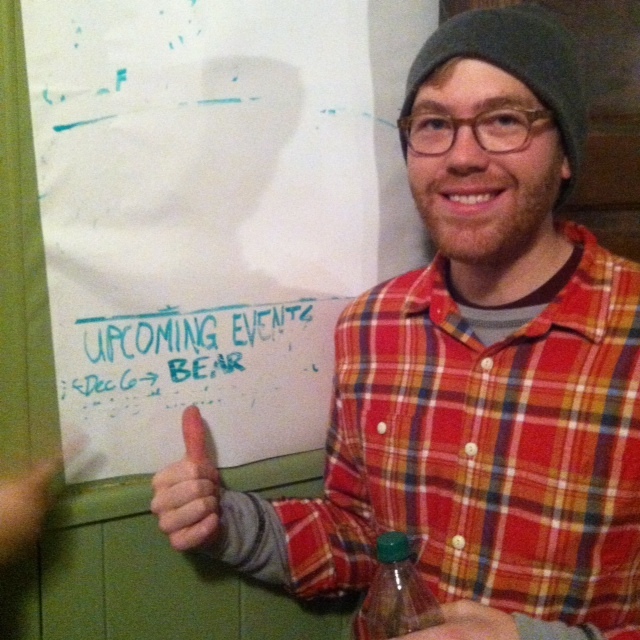 Needless to say, Portage is now a friend to BEAR, and you can bet your hibernating hind we'll be at their show at 7th St. Entry this Thursday night. If you're reading this and you were there, you're awesome. And thanks to Portage. And Steven Charles, too. We can't forget our dear friend Eric who set the show up. There's no place like home, and Midway House felt like home for a few hours the other night. Matt and Midway House's official show calendar.